A key issue yet to be resolved is the amount of free allowances the different industrial sectors will receive in the next trading period. 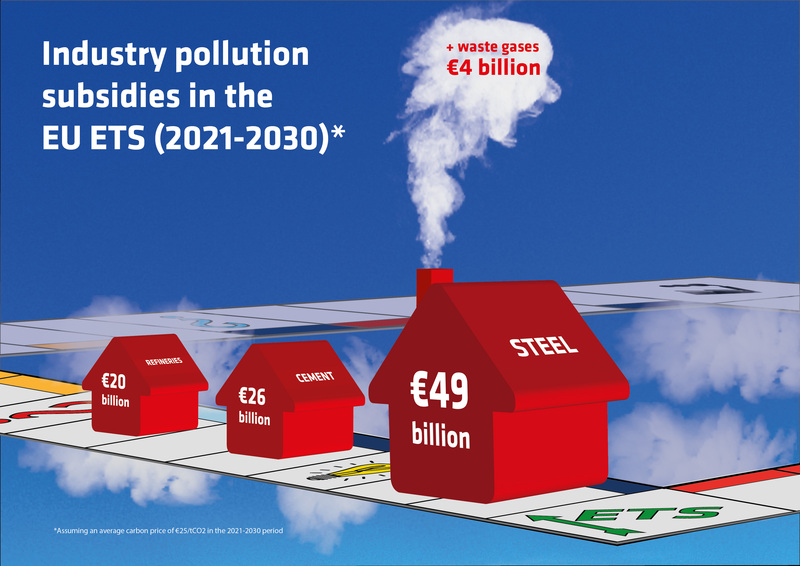 Responding to the Parliament’s concessions to award the lion’s share of the overall available free pollution permits to the steel industry, a ‘fair EU ETS’ alliance was established by the other industrial sectors that fear discrimination under the EU ETS. Other outstanding issues still negotiated by the Parliament and the Council are the size of the Innovation Fund, the introduction of a Just Transition Fund and the level of overcompensation to steel for energy production from its waste gases. Fair for the climate: To bring the EU ETS in line with the Paris goals and make it a truly fair instrument for the climate, much steeper emission cuts are needed by increasing the LRF from 2.2% to 4.2% from 2021 onwards. The EU needs to reach net zero emissions by the year 2040, but at the current pace, this would happen only in the year 2058. Fair for EU’s citizens: Divide the costs of the low-carbon transition more equally between citizens and industry, by limiting the amount of free allowances to industry in the 2021-2030 period and moving to full auctioning as soon as possible. The proposed overgenerous hand-out of free allowances to industry in the next period means that taxpayers could lose out on up to €175 billion in ETS revenues. Fair for workers: Up-skill workers for the low-carbon transition through a new Just Transition Fund to be financed from auctioning revenues. Corporations stand to make a €19 billion windfall from the EU ETS revision, while workers are left out from any compensation. The Parliament has proposed to correct this by introducing a Just Transition Fund after 2020, potentially raising €4 billion. Fair for energy producers: Remove discrimination between the industry and power sectors by eliminating unjust overcompensation to the steel sector for its energy production from waste gases, as proposed by the Parliament. Fair for industry sectors: Tailor carbon leakage approaches according to evidence of observed risks in industrial sectors, to avoid unjust treatment of sectors at lower risk, and introduce sector-specific approaches beyond free allocation, such as border taxes combined with full auctioning in the cement sector. Fair for innovators: Auction all allowances in the future and thereby increase the revenues for low-carbon innovations. In the 2021-2030 period, subsidies for industry pollution will be over ten times higher than support for industry innovators. This means industry’s biggest polluters benefit from over-generous free allocation while front-runners only receive limited financial support for their innovations. The Parliament slightly corrected for this imbalance by increasing the Innovation Fund from 450 to 650 million allowances.